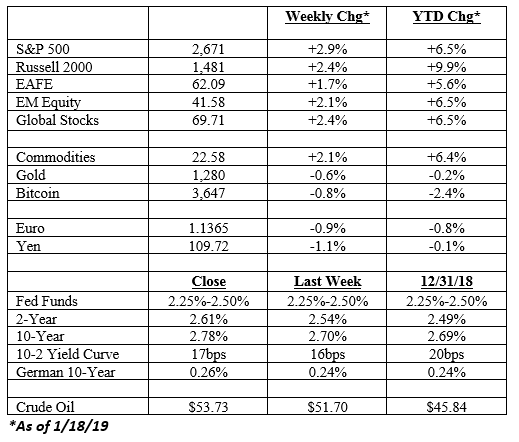 Equities had another solid week with the S&P picking up +2.9% while the NASDAQ added +2.7%. All the global indexes are in the black for the year after the drubbing they took in December. Bond yields have drifted modestly higher, but the moves have been relatively small. Credit has bounced back with the equity market – high-yield is up +4.2% so far this year. Crude oil has rebounded while gold prices have softened. The long simmering Brexit fiasco started to boil over this week. Prime Minister Theresa May took her plan to Parliament and was quickly rebuffed. And not in a small way either. As it turned out she suffered the worst parliamentary defeat for a British leader since at least 1924. 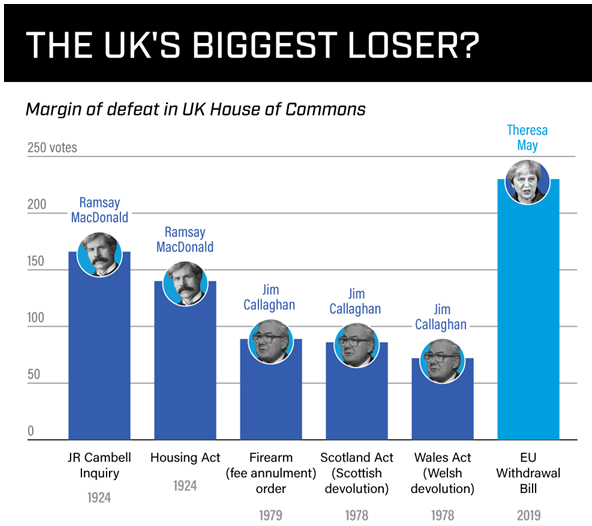 The last British leader to even come close to matching her 230 vote loss was Ramsay McDonald. Marx would be proud apparently, but the British were not amused. He was charged under the Incitement to Mutiny Act of 1797. This became the Campbell Case, and ultimately Labour leader and Prime Minister Ramsay MacDonald chose to drop the prosecution. Both the Conservative and Liberal Party thought he had come under the sway of communists and won a vote of no confidence. This led to the 1924 general election. So, it turns out that Theresa May’s defeat was worse than that of a Prime Minister suspected of being a communist sympathizer. Impressive!! Alright, enough history. I’m not going to go down the rabbit hole of what happened and what could happen now that the deal has been rejected. Suffice it to say that the whole thing is a bloody mess. General election, extension, hard Brexit? Take your pick. But the markets are maybe sniffing something out. Right after the vote the pound sold off dramatically against the dollar. However, as the news settled in it rallied back to close essentially unchanged on the day. What gives? 1. May’s government isn’t going gently into that good night. Labour floated a motion of no confidence, but the Tory MP’s and (critically) the Irish won’t abandon her for the on again/off again communist Corbyn (what is it with British politics and communists?). And Labour probably doesn’t want the job just yet. Let the Tory’s deal with the mess. 2. When in doubt kick the can. It’s pretty clear no deal with satisfy enough people to get this done. So, when in doubt stall for time. It wouldn’t be shocking to see an extension to the March 29th deadline. 3. The size of the defeat suggests that it will take more than modest tweaks to get a deal across the line. Instead, May will now face growing pressure to seek a much “softer” Brexit that maintains close ties between the UK and EU. 4. Finally, pass the buck. If the politicians refuse to make the hard decisions then the odds of another referendum grow meaningfully. The government shutdown moves into its fifth week next week, a new record. So far the fallout has been relatively limited, crimping the travel plans of the House Speaker and us mere mortals who have to deal with TSA. And as it turns out, our own home bred fiasco is hurting President Trump’s approval rating more than the stock market, as you can see below. Historically, the 20-odd shutdowns over the last 50 years have been brief, averaging one to three weeks with really no material impact on either the economy or the markets. This one could have more of an impact for two reasons: its record length threatens spillover to the broader economy through government contractors, for example; and this conflict could soon overlap with February/March political risks around the Mueller report and the debt ceiling debate. To put the shutdown into context, furloughed workers make up about 0.5% of the total U.S. workforce and contribute roughly about the same to the economy. That means an extended shutdown could shrink the economy by 0.5% in the first quarter, or 2% at an annual rate. Of course, things would bounce back once the shutdown comes to an end, but the short-term pain is building. On Friday Fed President John Williams noted that the shutdown could have a significant impact on growth in the first quarter and could affect consumer spending. He expected it could take half a per cent or a per cent off growth and acknowledged Fed policy could be impacted. 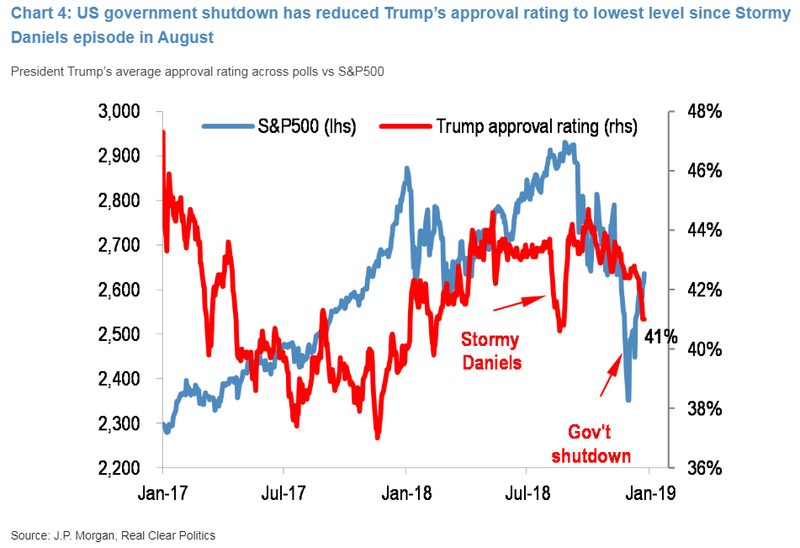 So why the resiliency of the market in the face of shutdown? A couple of key factors are at play. First, the Fed has backtracked noticeably. Last week a trio of senior Federal Reserve policymakers have counselled a wait-and-see approach to US interest rates. Chairman Powell has also communicated patience. A good example comes from Charles Evans at the Federal Reserve Bank of Chicago. He’d been relatively hawkish the last few months, predicting the central bank would eventually lift its target rate a little above neutral levels. However, last week he said that inflation was not showing “any meaningful sign” of heading above 2% in a way that falls afoul of the Fed’s inflation target. 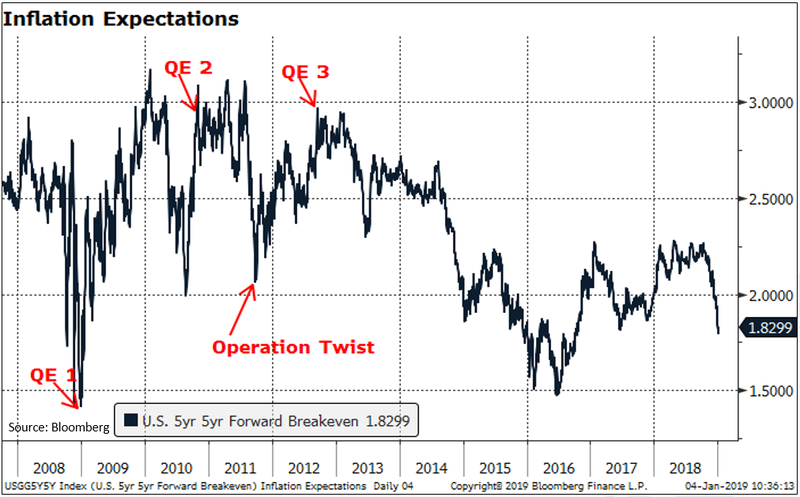 You can see this in inflation expectations (chart below) that have plunged recently. Evan’s said the Fed had “good capacity to wait and carefully take stock of the incoming data and other developments.” He also suggested he would like to wait before further monetary moves. 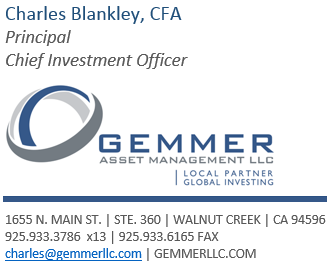 “I think developments in the first half of 2019 will be very important for making this assessment of our future monetary policy actions,” he said. This certainly takes the March hike off the table. It may even take the June hike off. Then this week they rolled out a new fiscal stimulus package. Some analysts believe China could deliver 2 trillion yuan ($296.21 billion) worth of cuts in taxes and fees, and allow local governments to issue another 2 trillion yuan in special bonds largely used to fund key projects. You are already seeing positive hints in the data. 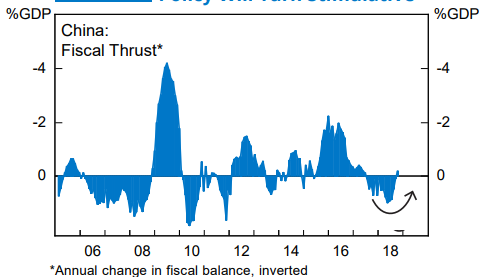 The chart below shows how fiscal policy might have reached an inflection point. 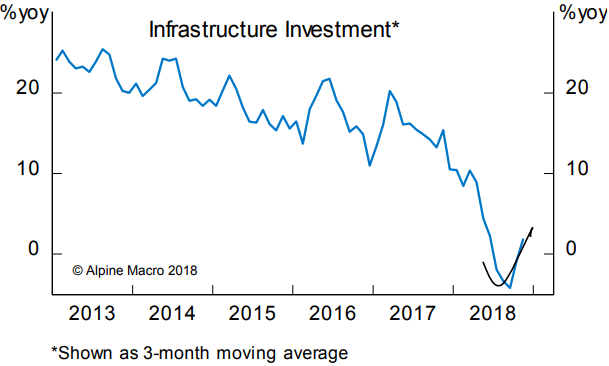 Another comes from infrastructure investment that has started to grow again. 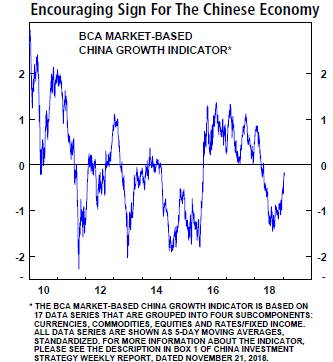 Bank Credit Analysts puts together a growth indicator. This is hooking higher as well. To the extent China rebounds it will alleviate all the talk about a global recession and boost risk assets in general. Next week all eyes turn towards the big three pending issues. Will the shutdown be resolved? What’s happening with the trade negotiations? And what will fourth quarter earnings look like? Plenty to cover next week.